The internet is rife with plans and blueprints for good, functional outbuildings. The only problem is that you still have to go looking for them, and you really don’t know from the outset whether or not the plans are correct and complete. Add to that, the good ones are often sold per digital copy. That’s where Monte Burch’s Building Small Barns, Sheds & Shelters fills the need perfectly. It’s a one-stop book for hobby farms, smallholdings, single-family subsistence living and more. 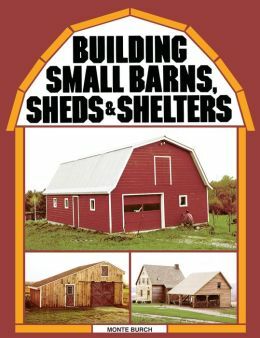 Building Small Barns, Sheds & Shelters starts off with a short introduction to the author with a word about his building and farm experience. Next, Monte Burch suggests methods for planning, an introduction to materials and tools, and then several chapters that detail a critical part of the building process. These include footings and foundations, framing, siding and roofing, windows and doors, finishing details, wiring, and plumbing. While the steps alone will help give you some good ideas of how to build your own custom buildings, Burch has also included a number of ready-made plans for outbuildings and agricultural buildings. These offer great ideas for small barns, root cellars or storm cellars, carports, sheds, poultry housing, rabbit housing, pig housing, a smokehouse and fencing. In short, it touches on all the really important smallholding buildings for the motivated DIYer. Each section boasts detailed pictures and drawings that make it really easy to visualize the structure or technique in question. The text is clear and concise, and makes it really obvious that you’re learning from someone who knows this process inside and out. Even if you’ve never built anything in your life, you may discover your level of confidence rising exponentially about undertaking one of these projects. If you can’t snag a live building mentor, this is the next best thing. Because the book was published in 1983 it may miss some more recent building techniques, but these buildings’ functionality is truly timeless so that’s not likely to be a big issue. Think you don’t have a big enough acreage for small-scale farming? Check out everything these people do on just 10 acres. This is the type of operation that Monte Burch’s book is meant to help get started. I originally picked up this book because I wanted a few more ideas for hog housing. To date, I’ve only built a couple of hog sheds in my life and had some leading help with those. I was impressed that a regular shed, finishing house, and a farrowing shed are included in the plans – all of which are necessary for my future plans. While this is the only section I was interested in at the time I picked up the book, I also got some other great ideas for my own future acreage and the requisite buildings for my hopeful return to retail-independent living. To be honest, I really didn’t expect this kind of value for the low cover price – about $10 on Amazon as of 2015, and free through Kindle Unlimited – but Building Small Barns, Sheds & Shelters certainly far surpasses many other books of its kind. Unlike many “building books” that try to fill up space with numerous examples of various buildings in some unknown countryside, this book is chock-full of useful information, and a clear way to use it for your own buildings. It focuses on the exact measurements, necessary features and desired form of the building, giving you everything you need to actually go out and build it. Bear in mind that this is aimed at someone with at least some land, and contains very little that might be of use for a homeowner with a large backyard. If you just want to build a little storage shed, doghouse, or privacy fence, there are certainly better options. If, instead, you’re trying to find ways to build storage and small-scale farm buildings, get this book first and then fill in any holes, if any, with other books. I’m personally aiming to acquire about 35 acres with a few hogs, chickens and alpacas, and this book provides buildings that are perfectly suited for this small (but not tiny) scale.